Upon arriving in Maine, it was quite wet. The landscape was lush and green, but still wet, and a misty rain continued to fall during the afternoon as Megan and I rode with her father and brother to pick up some "Beeah" (that would be beer) in the touristy and historical Old Port section of Portland Maine. It was wet. I wasn't going to be taken my new fancy lens that I had rented from lensrentals.com this day. 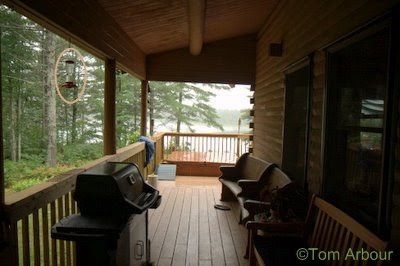 But upon arriving at Little Pond, I stepped out onto the back porch of the house which faces down towards the marsh, and saw a hummingbird feeder hanging from the edge of the roof, full of syrupy goodness. 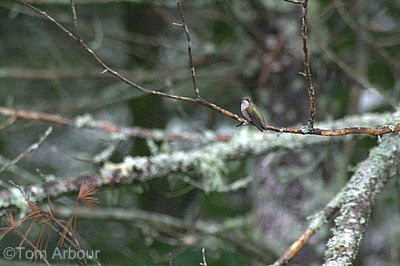 Sure enough, as I looked left, there was a female ruby-throated hummingbird resting on a lichen covered snag. I popped on the telephoto lens and fired off a few shots. 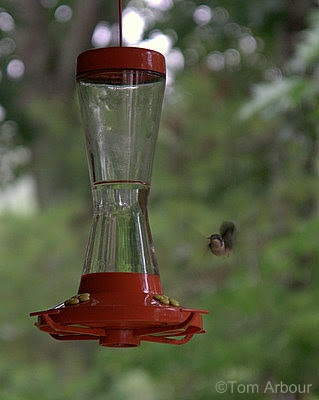 After watching her a few minutes, she came to the feeder. I was ready with my flash. 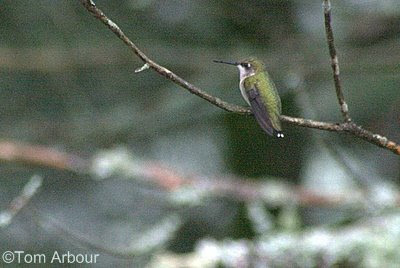 Like a lightning bolt, another hummer darter towards the feeder, but this afternoon, this was a one-hummer feeding station. 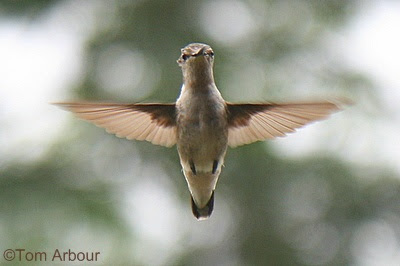 It seemed as if this female had laid claim to this feeder. 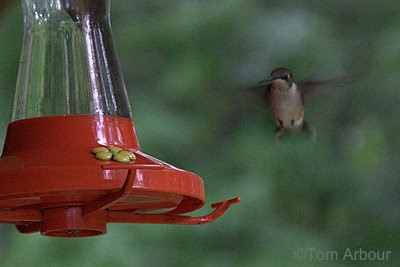 I watched for thirty minutes as other hummers made dozens of attempts to alight on the perches, and the female continually chased them away. The rain continued through the evening and night, and to the next morning. Just a little "Scotch Mist" was falling, according to my father-in-law, but it was still quite wet- too wet to take out a $1000 piece of glass that I was renting, but I still wanted to use it. 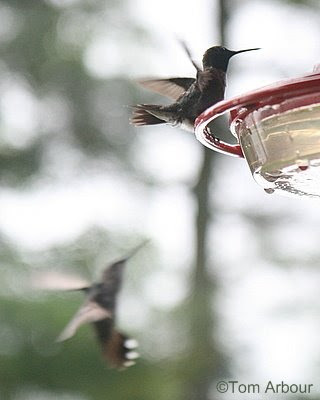 There is no reason I couldn't have the hummers acclimate to my presence, stand about five feet from the feeder, and get decent shots with the 55 mm lens I was using, and perhaps crop the images a bit. So I tried this, using the lens wide open at F 2.8, and got several shots that I was happy with. 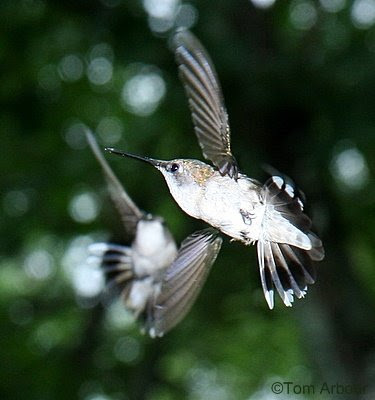 Not using flash, I was able to get just enough motion stopped so that the head and bodies of the hummer is in focus, but the wings and tail show blur. 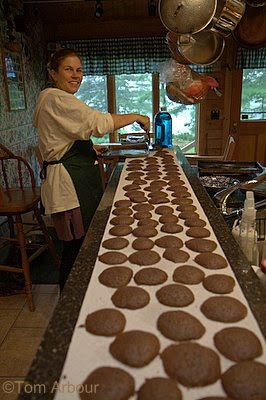 After getting slightly bored of taking hummer photographs, I walked to the kitchen, where Megan had been busy since waking up creating a fresh batch of whoopie pies, a Maine dessert curiosity. Here she is laying them out on the countertop to cool. I contributed to this baking effort by eating a few to make sure that had come out properly, and I can attest, they were delicious, even though they weren't quite yet finished. The pie is like a sandwhich, with two of these cookie type things on the outside with a thick layer of cream filling. They are superb creation, and Megan's were no exception. These were headed to the welcome gift bags each group of guests received upon arriving for the wedding weekend. But as I was in the kitchen, I noticed that Glenn and Kate had hung another hummer feeder just outside the right window behind Megan. 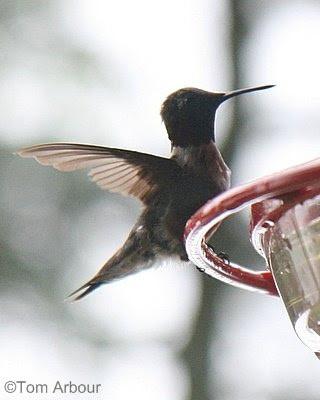 They've had this feeder before, but the window has a screen on it, so I just never considered capturing hummer images from the kitchen. On further inspection of the screen, I realized that I could pop it out by releasing two levers. It was off very quickly, and after a wipe of the glass with Windex and paper towels, I was ready. 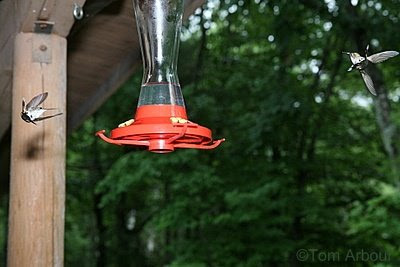 This was a tough place for the hummers to acclimate to me, because I was less than a foot away from the feeder. It took them a little while, and this one hovered peering into the window at me and the camera. 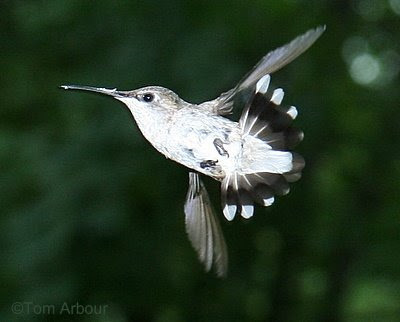 Finally, what looks like a male hummer (he doesn't have white-tipped tail feathers) was brave enough to land, although the female arrived quickly to chase him away. In the end, I was just two close to the kitchen feeder, so I headed back out to the porch, but this time, I though, why not use flash with the new lens, and see what happens. I got the best results yet, and after this round of pictures, I was satisfied. 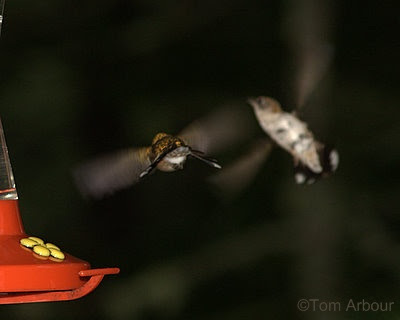 The aerial maneuvers and interactions between individuals is fairly incredible. 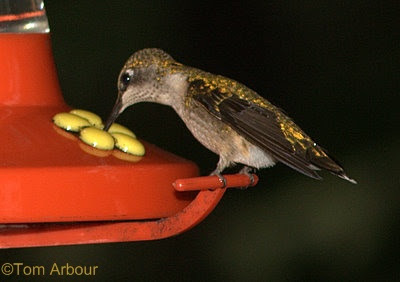 Toward the end of my observation, it seemed as if the female had lost her grasp as sole user of this feeder, and finally, several hummers enjoyed the sugary food together. Great Photos - Please stop by and check out my blog. Iowa Nature Photos will now be a photo blog with no caption or commentary. I do not have the time to dedicate to my blog that I have in the past but would still like to post photos. I hope that you will continue to support my blog in the future. Thank you. I know how time consuming it is to keep up with a blog! I'm anxious for winter when I'll have more time to read others blogs as well, I miss that! Fascinating photographs. Depending on how busy you are you might want to read about my deer hunting adventures at Shawnee State Forest back in 1958. I will put the Deer Hunting story on the Brookville Blog for Sunday (or tomorrow). I sometimes wonder if I could still walk through the woods without making a sound. That sounds very interesting, I will have to read your post. Shawnee is one of my favorite places in Ohio. 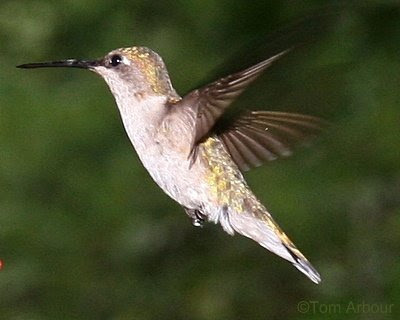 Tom: Super photos of the hummers, they just did a great job of posing in all those positions. 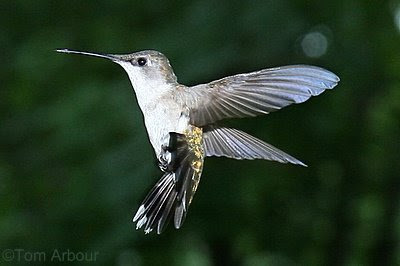 Wonderful hummer pictures! I love those ones with the tail spread out! I've never managed to catch them when they peer in the glass at me either! Cool! Tom & Mary- Thank you very much. And Tom, you are correct, they were extremely cooperative models, taking my instructions quite well. I hope you don't mind, but I've included this post in I and the Bird #83. Wren, thank you very much. Great catches. The acrobatics are amazing! Thanks for capturing and sharing!